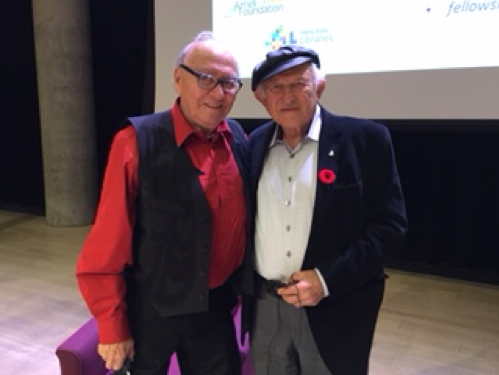 Recently our memoirs program’s in-house education team travelled from Toronto to Winnipeg for a series of programs featuring Holocaust survivor Nate Leipciger, author of The Weight of Freedom. Our team’s first stop was for a school presentation. With 120 middle and high school students in attendance, Leora Schaefer, Executive Director of the non-profit educational organization Facing History and Ourselves Canada, moderated an important conversation between Nate Leipciger and Theodore Fontaine, a Canadian Residential School survivor. The audience was engaged and attentive and asked some of the most thoughtful and profound questions we’ve heard. Facing History and Ourselves Canada has developed a resource for teaching about Residential Schools. Leora Schaefer moderates a conversation between Theodore Fontaine and Nate Leipciger at a school in Winnipeg. The next day, we accompanied Nate and his wife on a visit to Winnipeg’s excellent Canadian Museum for Human Rights. Spontaneously, Nate began speaking about his experiences to a group of students standing by the Auschwitz display. The students asked questions and were humbled to meet a survivor of the atrocities they were learning about in the exhibit. Sunday was a busy day! In the afternoon, we led a teacher training workshop at the Canadian Museum for Human Rights in partnership with Facing History and Ourselves Canada. The group of twenty-one Manitoba teachers left this professional development opportunity with resources and strategies for using personal testimonies to teach about the Holocaust and Canada’s Indian Residential Schools. On Sunday evening we held a well-attended public event at the museum about the power of memoir and storytelling. Once again, Nate shared the stage with Theodore and Leora to have an honest and emotional conversation about using words to heal after trauma. The event received some local press coverage about these two men who “grew up on opposite sides of the planet, in different cultures, where powerful forces were at work trying to wipe out their identities." Dr. Stephanie Corazza is the Education and Curriculum Associate for the Azrieli Foundation’s Holocaust Survivor Memoirs Program. She received her PhD in History from the University of Toronto in 2017. Her research focused on social workers involved in child rescue networks in France during the Holocaust. In addition to experience teaching history at the undergraduate level, she has also served as an educator and historical consultant for Facing History and Ourselves. Reading the memoirs of Holocaust survivors can be difficult and emotional. Our authors not only describe the tragedies and despairs of suffering and surviving, but they also reminisce about the pre-war Jewish life that was lost in their hometowns. They write about daily life and culture in their villages, towns and cities, from the mundane to the rituals to the food they used to eat. Reading about the food is one of my favourite parts of the memoirs that we publish — how families celebrated the Jewish holidays and Sabbath, and how most of the memories of these joyous occasions are tied into what they ate. Food is not what most people think about when reading a memoir of a Holocaust survivor, yet I find these descriptions so important. I am interested not just because of how food and tradition universally unite people but because, as important as it is to remember how millions of Jews died, it is equally important to remember how they lived. Words referencing mass atrocities of the past, such as fascist, racist, Nazi, genocide and Holocaust, carry deep historical meaning, yet these words are often misused in reference to contemporary events. Using these words too casually not only diminishes the meaning of the words themselves, but also diminishes the events that the words represent. As Holocaust Remembrance Day approaches, we look to the meaning of the term genocide and the conditions that drove a lawyer named Raphael Lemkin to coin this term to describe a horrific crime — a crime that prior to 1944 lacked a name and legal repercussions.